Over the Ascension long weekend, the best 16 U11 players in Switzerland were invited to tour England playing six matches against teams in Surrey. 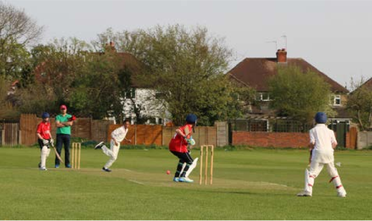 All matches would be 20 overs and would give most of the players their first experience of playing on grass pitches. 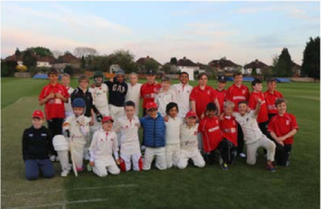 The tour opened with a match against the Academy side of T20 International (who had run two of the training weekends, and organized the fixtures) at Deando Ruxley CC. T20 elected to bat first and were probably surprised at the accuracy of the Swiss bowling. Ethan opened the account with a wicket-maiden with his second over and Alistair, Ross, Kabir, Ali and Charlie all picked up one a piece. Coming on as the last bowler, Sasha took two in one over showing the depth of the bowling talent. T20 found runs hard to come by with only A Cormack getting to double figures finishing on 26. T20 batted out their overs to finish on 80- 8. Kabir and Ross started the reply well taking their time and running hard as well as finding the boundary a few times. Kabir went on to retire on 20. Gianni also batted well making 14. The rest struggled with the pace off the pitch, but managed to keep the scoreboard ticking over and Ethan found the boundary in the 17th over to take the match, and finish on 81-6. A beautiful morning made a great backdrop to a four- hour training session at Deando Ruxley with the T20 coaches, led by Mazza. The evening brought a match at Farnham. This time, the Swiss batted first and with the confidence from the evening before, got off to a flier. Ross and Kabir both retired on 20 having hit a number of boundaries. Alistair continued the fast scoring, retiring on 16 with two boundaries. 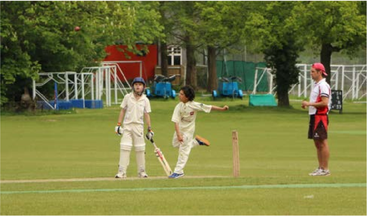 The middle order pair of Gianni (10) and Ali (9) continued the hitting, with Ali improvising some shots, and they both found the boundary twice before being bowled. Vadim (5*) and Ethan (4*) worked the singles to finish off the innings, with the Swiss on 136-3. The Swiss bowling attack was too much for Farnham with no player making it to double figures, and only six bowling extras given. Euan had the best figures with three wickets to open his account. Paolo did likewise with his left-arm round the wicket angle, to take two. Vadim’s leg spin accounted for two more and Ali finished Farnham off with two wickets in his first two balls. Farnham finished on 44 all out. With the sun shining, the beautiful and quintessentially English Thames Ditton ground was the venue for the third match. The Swiss batted first and again Kabir (14) and Ross (13*) got the team off to a good start with good placement and running. Owen came back from his first baller to hit a watchful 10*, never looking troubled. As it was Thames Ditton’s first match of the season, extras mounted. With the last ball of the innings, Ethan sacrificed himself looking for the second run and was beaten by a direct hit, so Swiss finished on 104- 6. In reply, the Thames Ditton openers found runs hard to come by with the accurate Swiss bowling. Ethan, Owen and Kabir all bowled a maiden over. Aarit ripped out the middle order taking a wicket in each of his three overs (and would have been four if not for over stepping). But even that performance was overshadowed by Sasha polishing off the tail by taking a hat trick. The first ball took the top off William’s off-stump. The second took the top of Ajay’s leg stump. Ben could only poke the third into the air straight to the hands of Charlie at a shortish leg, to scenes of jubilation Thames Ditton managed to see out the last few overs and finished on 67-9. With confidence high, the team moved on to a challenging match at Rokeby. Bowling first, they put in a strong performance with the ball, conceding only nine extras. Gianni got things going with two wickets, before the leg spin of Vadim completely foxed the middle to bottom order. Taking three wickets (and almost a hat trick if not for over stepping) he was well supported by Thomas behind the stumps. Webster showed his county level class retiring on 25. Another accurate bowling performance (only nine bowling extras) restricted Rokeby with only one other player making it into double figures. Wickets kept falling, including to Ali who took a wicket with his first ball, giving him a hat trick over two matches! Rokeby finished on 91-9. In reply, Switzerland found the going tough, losing Kabir (8) and Euan (0) in quick succession. Owen (5) and Ross (1) started to rebuild, until Ross was run out looking to up the run rate. This brought Gianni (12) on, who immediately looked aggressive, hitting consequtive boundaries before being bowled. Tight bowling and excellent fielding made runs hard to come by, and the Swiss eventually lost their last wicket with four balls to spare, on 61. Sunday morning brought more beautiful weather and another trip outside of the M25 to Great Bookham. On inspection of the pitch it looked like it would be a low scoring wicket- fest with long grass on the outfield and some divots on the pitch. How wrong first impressions can be. Effingham batted first and came out of the blocks running, with Jake hitting two sixes. The Swiss bowlers found it difficult to maintain their accuracy on a pitch with a slope in both directions and the wides mounted. Greg, keeping, had his work cut out with some balls sailing over his head and some arriving at his feet. The outfield turned out to be quick enough, and apart from variable bounce, the batsmen were able to play their shots. Only two wickets fell to Kabir and Ross. As the last day of the tour, tiredness seemed to set in and the fielding standards slipped, with a good 10 runs given up in the last three overs. Effingham reached 128-2 off their 20 overs. With the previous day’s batting in mind, the target looked tough, but after a talking to from the coaches, the Swiss U11 openers got things off to a good start. Ross found the boundary early and Kabir soon followed, piercing the gaps. 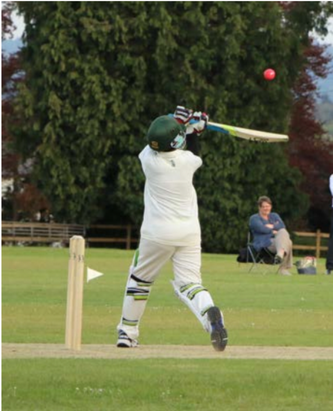 After Ross retired, Ethan came in and continued the hitting, finding the rope three times and hitting 20 off only 13 balls, with Owen joining him at the crease. Gianni also retired making 21 at faster than a run a ball. At the other end Owen played sensibly picking up ones and twos. The match was delicately poised with 16 needed from the last four overs. Looking to force the pace, Owen was then run out on 7. This brought a succession of wickets with Alistair (4), Charlie (1) and Aarit (5) all sacrificing themselves to try to get the winning runs. This setup a thrilling finish with the scores level and one ball to go. Greg at the striker’s end, and the tall Thomas at the other end. Greg dabbed the ball and set off, with Thomas coming haring in. The throw came to the keeper and Thomas dived for the line and just got his bat over to seal the match. There was no time to bask in the victory, as the players left for Cranleigh. Another beautiful location, with a fantastic pitch and outfield awaited them, as well as a well-deserved lunch. 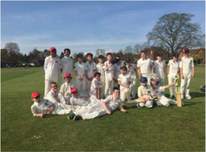 Cranleigh played a young team with U9s, U10s and U11s, and batted first. The Swiss opened the bowling with the “little and large” combination of Gianni and Sasha, both taking wickets. Thomas took a sharp catch off the glove from the quick bowling of Gianni to start things off. This brought a right+left hand pairing of Coveney and Dangerfield to the crease who started to rebuild. Both retired, and the rest of the young team struggled against and uncharacteristically wayward bowling attack. Two more wickets fell, including one to Matty, for whom this was his first competitive match since fracturing a leg in the winter. Also bowling his first overs on tour was Greg (with Thomas taking the keeping duties), who also bowled accurately. In the end Cranleigh made 81-5. After a delicious tea of ice lollies, the coaches changed the batting order. Looking to give some players more of a bat, Vadim and Euan opened. Vadim missed the first match due to a trip to A&E during the night for an allergic reaction. This didn’t seem to bother him, scoring quickly to make 14 off 9 balls before Coverney took the catch off his own bowling. Euan found it harder to get the ball away before Coverney bowled him for 3. This brought together Aarit and Sasha. Aarit hit a couple of boundaries, as well as some good running made 19* off 18 balls before retiring. At the other end, Sasha looked to shake off the Boycottian performance from Thames Ditton and swept four boundaries to retire on 20. Greg and Thomas ended up at the crease, both making a single of the only ball they faced to take the Swiss over the line on 83-3. The Swiss U11 team finished their tour with 5 wins from their 6 matches, outperforming all expectations. The relatively young team (a number of U10s and one U9 made up the team) came together to put in great team performances after another. They bonded so well that other teams assumed they played together regularly. 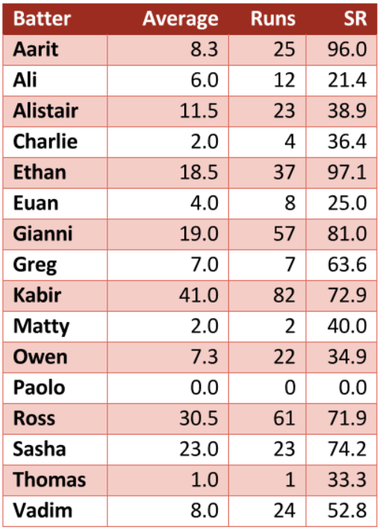 As well as the team performance, every player had significant individual contributions to the overall result. More importantly they had great fun both on and off the field. The bowling performance was the stand out. The Swiss team consistently bowled more accurately and all the way down the order than the teams they faced. Ethan provided a great start as opening bowler taking wickets and bowling economically. The team bowled all the way down with two hat tricks (Ali + Sasha) and one almost hattrick (Vadim). The batting started slower, with only Kabir and Gianni having experience on grass pitches. 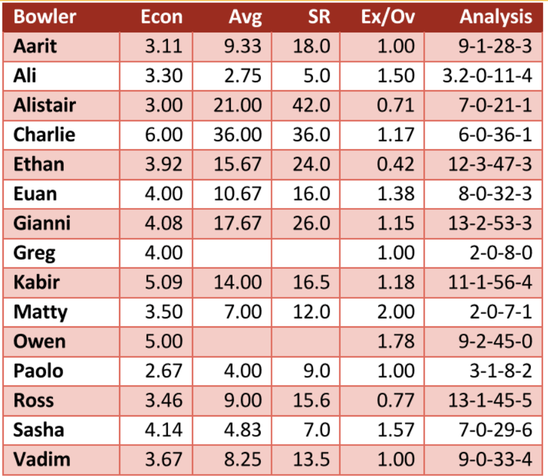 That said, Kabir and Ross provided a good start in most games, and Gianni providing middle order runs. As the tour progressed the other players started to find runs – with better running and also finding the boundary. The fielding was probably the weakest part of the overall performance, but apart from one game, this also improved over the tour with more accurate throwing, catching and backing up. The wicket keeping in particular should be highlighted, with no out-and-out keeper in the squad, Greg and Thomas both put up their hands to take the gloves and started training in the winter. The overall Swiss player of the tour was awarded to Kabir for his excellent batting (82 runs, averaging 41.0), bowling (4 wickets, average 14.0) and all round performance. Huge thanks to Pavel and Pete for the tireless coaching of the team over the last few months – providing the support, encouragement and sometimes a stern word or two. Thanks also to Darren of T20 for organising the fixtures, and Mazza and the other T20 coaches for their work and support over the coaching weekends and the tour. Huge thanks to the hospitality and competitive cricket from the six clubs we visited. They truly gave a taste of cricket in England. Lastly, thanks to the parents for their taxi services, support, warm ups and scoring! Further information on the Swiss U11s tour to England contact Michael Hall. 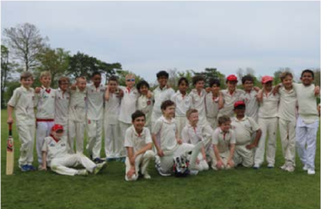 You can also read Robin Maslin's T20 International's review of the Swiss U11s tour to England.